I often visit local yarn stores when I travel. The skeins I buy on trips are always more special because the things I knit from them have a hidden story only I know. I found this gorgeous skein of Rowan Fine Art in the beautiful city of Edinburgh. Variegated hand-dyed yarns can be tricky to work with, they want your attention so much that more intricate patterns are usually rather suppressed by them. 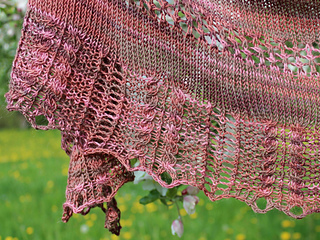 With Lily Magnolia, my goal was to create a harmonious design with simple yet pretty stitches that let the yarn shine. 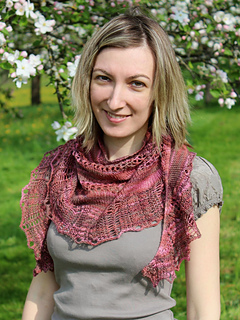 This shawl is crescent-shaped and worked from the top down. 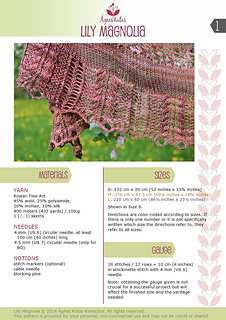 The pattern comes in 3 sizes with both charted and written instructions. 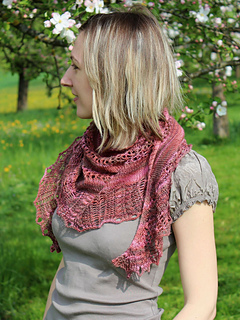 Available individually or as part of the Shawls to Dye for collection.